Seen at Tower of London grounds and in Cotswolds in public places. Slate gray with black cap. Black wings and back. Crow-sized. Gregarious. Any help appreciated! 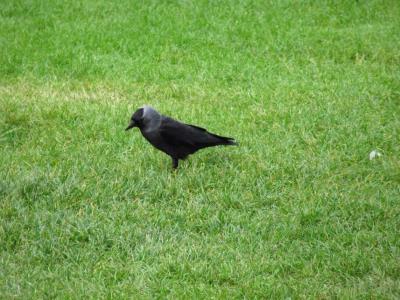 160 This "small crow" is a Common Jackdaw. Easily distinguished from other crows by the silvery area on the back of its head and piercing pale eyes.